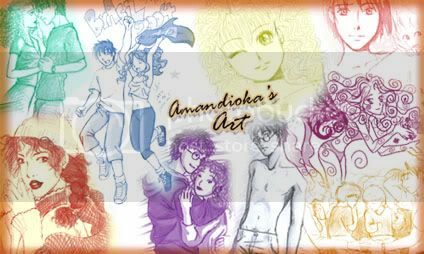 Welcome to amandioka's Art Community. Here you're going to find all of my finished art and simple sketches... I usually draw fanart for Harry Potter and anime/mangas I like, but you're going to find some original art too. *Anime/Manga - Ranma 1/2, Escaflowne, NANA, Sailor Moon, Howl's Moving Castle, InuYasha. *Books - Harry Potter, Twilight. - All R/NC-17 art will be FRIENDS-ONLY. That means you have to be a MEMBER to see it. To be a member, you have to JOIN this community. I'd ask to anybody younger than 18 NOT to join this community, but I know some would join anyway, so I'll just say: If you're younger than 18 years old and you join this community, you are aware that it contains adult material and that you are responsible for your your own decisions! If you or your parents (if they find out) will be offended by this stuff, don't join, please :) All other arts (art for minors, I mean) will be available to you if you only FRIEND this comm. Thank you! -If you want to make icons of my art, feel free ^_^ No need to ask, but I'd like to be credited. -If you want to make anything else (layouts or whatever), please ask first. -If you want to see my DeviantArt Gallery, it's here. -Any other questions, please leave a comment and I'll get back to you.